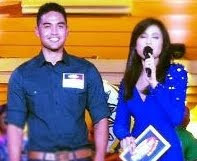 Carlo Romero of Chicago, Illinois, U.S.A., has improved his status from being a reserved housemate to an official Pinoy Big Brother (PBB) Unlimited housemate. “Kuya” announced on Saturday, November 5, 2011, that the 22-year-old hunk model, who was tasked to be a “mole” or spy inside the PBB house, has become an official housemate. From among the thirteen HMs, it was only Roy Gamboa, the “Sales Lakay” of Pangasinan, who voted him off. Majority said Carlo deserves a slot in the competition.